We made it! 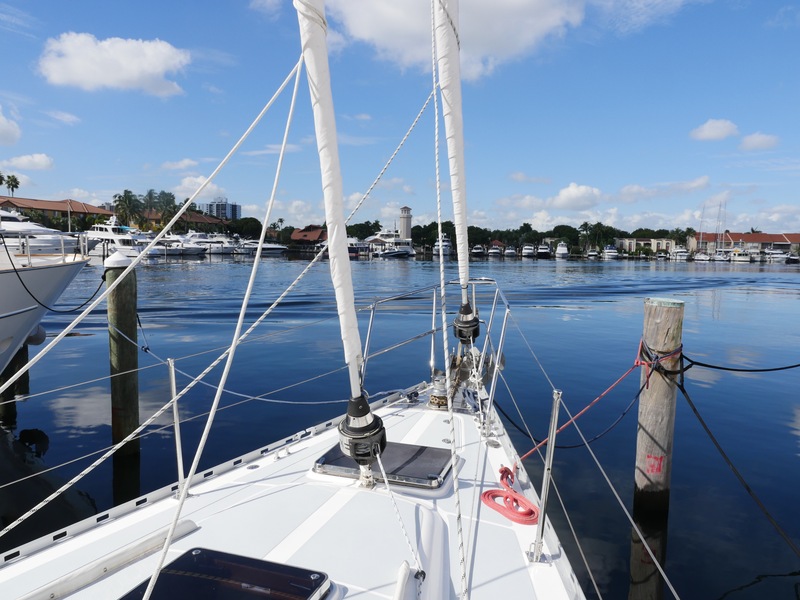 A long slog south from Annapolis, with one stop in Jacksonville, Florida, but now safely and comfortably ensconced in Loggerhead Marina, Aventura. A Whole Foods round the corner, WiFi, and our car and bikes on hand. It feels like we have only been flirting with Genevieve until now, but this trip was the first date. 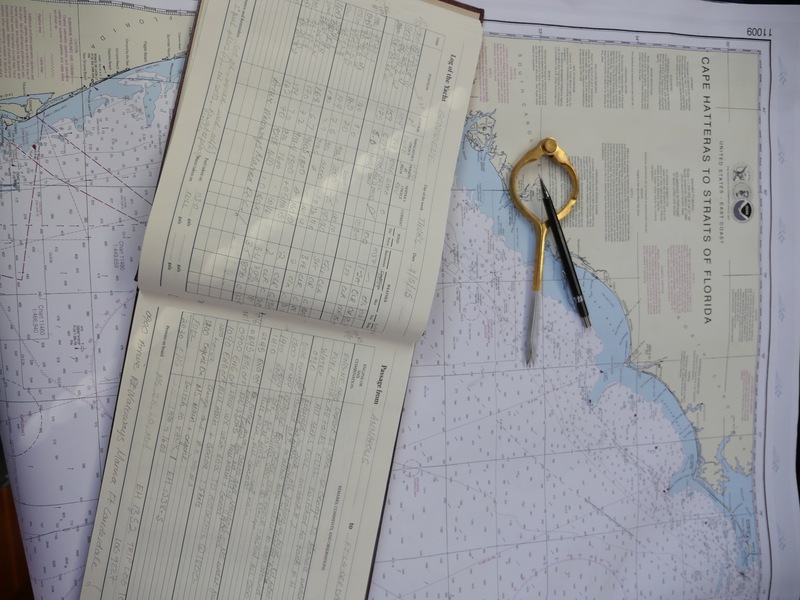 We got to know how she behaved in 30+ knot-winds and some choppy seas (very well) and tested the engine (which we call Donkey) during some long periods of motor sailing. We now know what it’s like to sleep–or try to–in our cabin as the boat is tossing on the waves and everything is at 30% angle. We worked out the best way to pee mostly in the head, how to boil the kettle without getting third-degree burns, and where all the grab handles are in the dark. We also found out that Donkey can be a PITA, mainly because we had not sufficiently done complete due diligence before we left. We also learned that apparently qualified Diesel Mechanics can do the most basic things wrong and put us into a serious situation because of shoddy work! 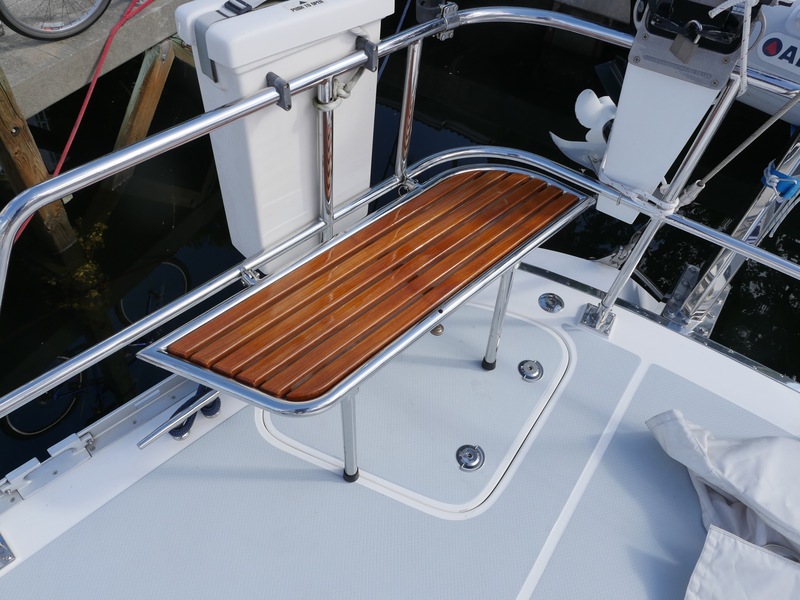 Oh, and those teak benches on the stern of the boat, which are commonly known as “Gin & Tonic” seats, have been rechristened “Puke & Vomit” seats! Puke & Vomit (formerly Gin & Tonic) Seat. On the up-side, we got Genevieve to 10+ knots, and put her under full sail: cutter-rigged with full main, 130% genoa and staysail. Now, we have an accurate read of fuel usage per hour at various engine revs, making it highly unlikely that we will ever run Donkey dry (which is a very, very bad thing on a boat). And John and I both had several chances at the wheel to get Gen in and out of some novel and rather tight docks without incident, yelling, or loss of pride/paint! We spent a long week in Annapolis before we left, getting Genevieve ready for the trip. Adding jacklines, securing stuff, adding some safety equipment like a JonBouy MOB system, positioning the new life raft, etc. Our hired Captain, Lou (Louise) Orion, joined us and gave us a long list of additional things to do, but in general, was very pleased with the state of readiness of Gen and the work we had done. Lou was a last minute addition to Gen’s crew after our sailing guru Mike Cox had to bail because of a monster project gone nuclear. Lou is a very experienced Captain who was willing to help move Gen South and to continue our training on the way. Joining Lou was crew member Mick Hatch, a retired Air Force Colonel who has his own lovely sailboat based in Florida, but who was willing to come north into the November Atlantic chill, just for the hell of it! 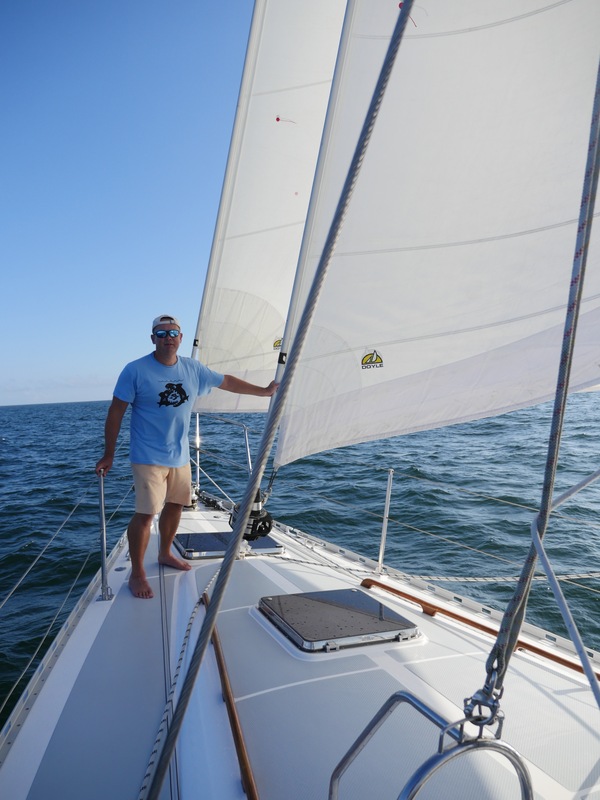 We left our Annapolis dock at Bert Jabin’s Yacht Yard early on Friday October 30 and headed down the Chesapeake for a 24-hour sail to the open Atlantic. This was fun, but became a bit more exciting once it got dark and the imposing, barreling tankers and tugs made safe passage-making more of a challenge. As dawn broke we pushed Gen’s bow out into the Atlantic Ocean, the traffic fell away and we were alone. We hugged the coast to Hatteras and fortunately had good weather to get around this infamous ship-cruncher of a headland. 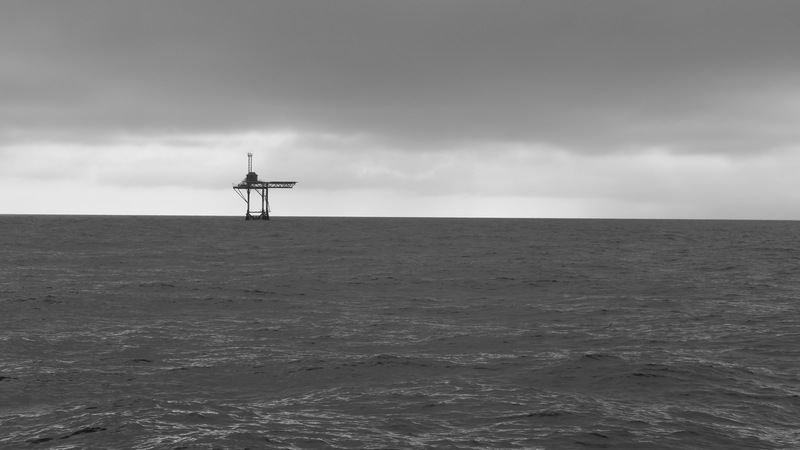 As we continued South, the coast fell away to the West and we found ourselves on the inner edge of the Gulf Stream a long way from land. We rarely saw other boats, but could occasionally see neighbors on the AIS heading north or south–mainly cargo ships, but a few other southbound sailing vessels too. We were far from land…but far from alone. Some friendly dolphins visited often, sometimes for just a fly-by, sometimes for an extended period of bow wake-surfing. The cetaceans seemed to really get a kick out of playing with Gen and certainly were aware of us…turning sideways to take a good look at the hominids on the deck waving and whistling to them. We got into the groove of our watches, John and I taking 4 to 8, Lou doing 8 to12, and poor Mick getting the dog watch 12 to 4. So John and I had 8 hours between watches, generally trying to sleep from 8PM until 4AM but from 8AM until 4PM we stayed up, snoozing on deck or discussing the world’s problems with the watch keeper. Crew generally had breakfast when we fancied, but gathered for dinner in the cockpit before dark (all supplies courtesy of a looong provisioning session in Whole Foods, Annapolis). Chart Plot and Ship’s Log. Just past Hatteras we noticed that Donkey the engine was not well. Donkey did not want to get above 1600 revs without faltering and spluttering. We investigated the fuel system, which seemed fine: we had cleaned all the tanks and polished 230 gallons of diesel before we left. The Racor primary filter was new, so we rounded on the Turbocharger as the culprit, cleaned it, but with no effect. So with miles to go, and John having spent some time on the Puke & Vomit seat, we decided to head into Jacksonville to take a break and to get to the bottom of Donkey’s troubles. As it turned out, Donkey needed a simple secondary filter change, but we asked the mechanic to also change the oil filter while he was in the bilge as a precaution. So next day, with Donkey all spritely, we left the dock and headed out into the St. John’s Inlet dodging large container ships and Navy Destroyers. For some reason, I decided to look in the engine compartment and was shocked to see the bilge full of oil…all of it rapidly draining out of the newly installed oil filter. We cut the engine, and drifted, added some more oil before the engine had a chance to seize up and headed back to the dock to correctly put in the oil filter, replace the oil and to clean 7 liters of oil out of the bilge. Four hours later we were good to go. From St. John’s River we stayed quite inshore down the Florida coast for a couple of days, eventually making Ft. Lauderdale. We followed a few cruise ships into the inlet and turned South down the Intercostal Waterway, through four bascule (opening) bridges to Loggerhead Marina, our new temporary home. Lou and Mick helped us scrub and polish Genevieve and after cracking a bottle of Veuve to toast our adventure, were off, back to their lives. Never trust mechanics to do things correctly: confirm and verify! How to change the oil, filters, etc, and the wonders of Oilsorb Pads for oil clean up! Next: Get used to life on Genevieve, explore the new ‘hood, do Thanksgiving in San Francisco with old friends, then on Gen head south for the Florida Keys for a month or so. Congrats gents!! Sounds like a great experience. Very cool -good for you both !